FREE VALUATION. To buy, auction, sell or consign your Mathew Brady photo that is for sale, please email Nate@NateDSanders.com or call the Nate D. Sanders Auction House (http://www.NateDSanders.com) office at (310) 440-2982. Please let us know if you have a Mathew Brady photo for sale. Top dollar obtained for your Mathew Brady photo or other Civil War photos. Mathew Brady is sometimes called the father of photojournalism as he was one of America’s earliest photographers. He is known for documenting thousands of images from the Civil War and with the use of a mobile darkroom he was able to share these images with the public. Mathew Brady also took portraits of many public figures such as John Quincy Adams and Abraham Lincoln. Brady also pioneered daguerreotypy, the most common photographic processing technique from about 1840 to 1860, in the states. We recently auctioned some Mathew Brady original photos. Details are below. Civil War Photo from “Brady’s Incidents of the War” Series — 4th N.Y. Artillery at Ft. Corcoran, Va. Measuring 14″ x 10″. Mathew Brady’s “Incidents of the War” series 1862 photo: “Near Head Quarters 4th N.Y. Artillery. Col. Doubleday / Ft. Corcoran. Va”. When the Civil War began, Brady and his field photographers shot many war views that were later published by the E. & H. T. Anthony Co. in “Incidents of the War.” Albumen measures 14″ x 10″, mounted to card stock measuring 20.75″ x 16″. Dampstain to lower right, just touching photo, and moderate overall foxing. Very good condition. Sold for $1,177. 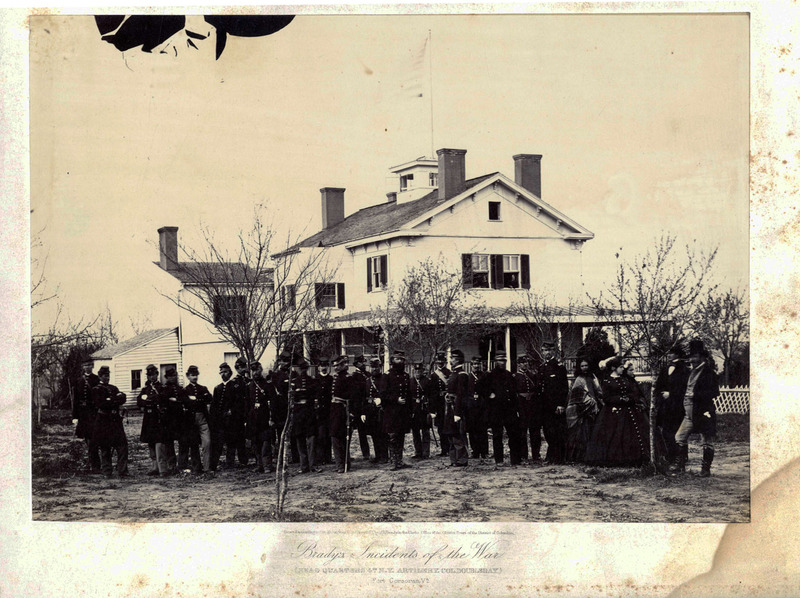 Civil War Photo from “Brady’s Incidents of the War” Series — 4th N.Y. Artillery at Ft. Corcoran, Va. Measuring 14″ x 10″. Click to enlarge. Civil War photograph of the U.S.S. Pawnee crew in Charleston Harbor, South Carolina, under Rear Admiral John A. Dahlgren commanding the South Atlantic Blockading Squadron. 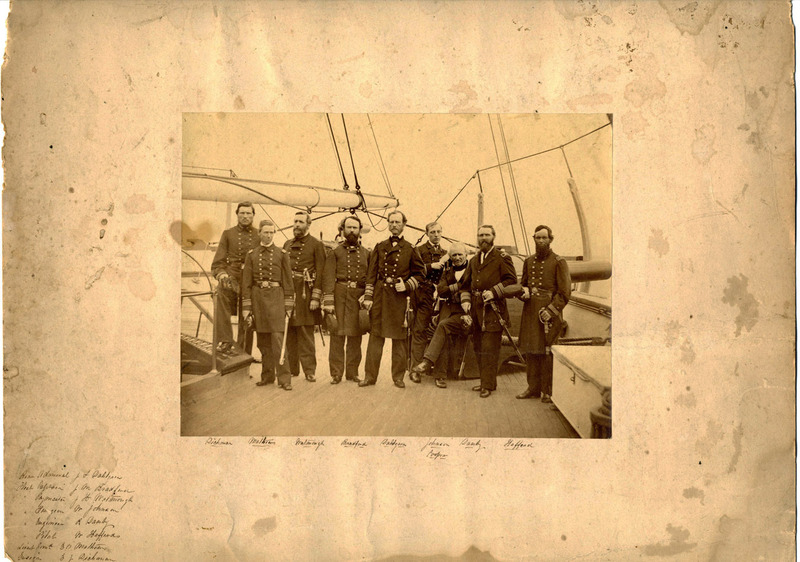 The 8.75″ x 6.75″ albumen photo, dating to 1864-65, is identified as a Brady photo from other, almost exact photos of the crew. Mounted on a 13.25″ x 16.25″ album page. Photo shows minor foxing; album page shows significant dampstaining and edge wear. Overall very good condition. Sold for $849. Mathew Brady Civil War Photo Circa 1864. Click to enlarge. 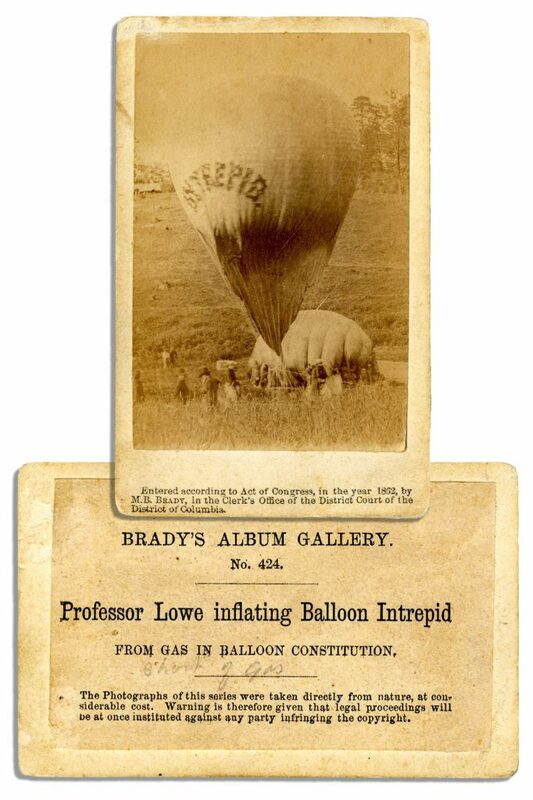 1862 CDV photograph by Mathew Brady of ”Professor Lowe inflating Balloon Intrepid from Gas in Balloon Constitution” from Brady’s Album Gallery No. 424. The balloon used to observe Confederate movements in the field was photographed here by Brady while it was launched during the battle of Fair Oaks. 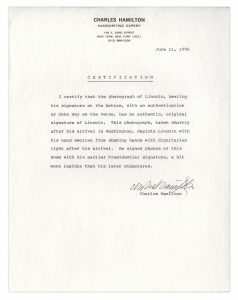 Statement printed on verso reads, ”The photographs of this series were taken directly from nature, at considerable cost. Warning is therefore given that legal proceedings will be at once instituted against any party infringing the copyright.” Photo shows minor fading and wear to upper edge and glue residue to verso, else very good condition. Sold for $1,008. Mathew Brady Photo from Civil War — ”Inflating Balloon Intrepid”. Click to enlarge. Martin Van Buren CDV taken in the late 1850’s by Mathew Brady. Van Buren served the young nation in many capacities before becoming the eighth President in 1837: attorney general and governor of New York, U.S. senator, ambassador to England, Secretary of State and Vice President under Andrew Jackson. 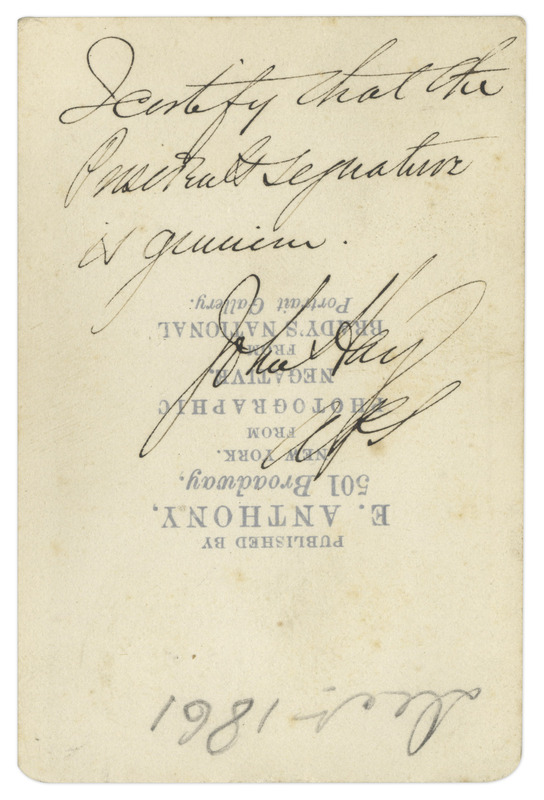 CDV is stamped on the verso: ”E. & H.T. Anthony, 501 Broadway, New York. / From Photographic Negative in Brady’s National Portrait Gallery”. Very good condition. Sold for $349. 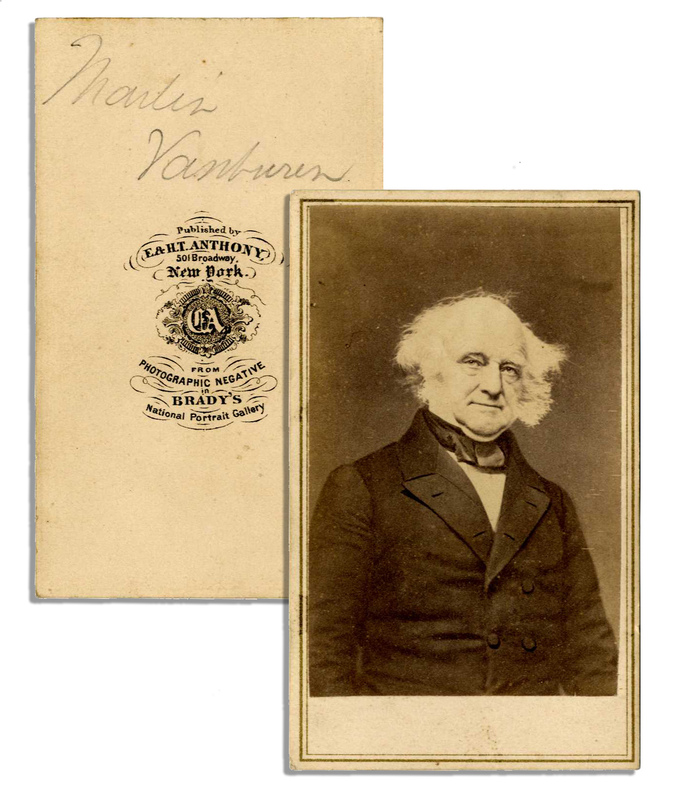 Martin Van Buren CDV taken by Mathew Brady. Click to enlarge. 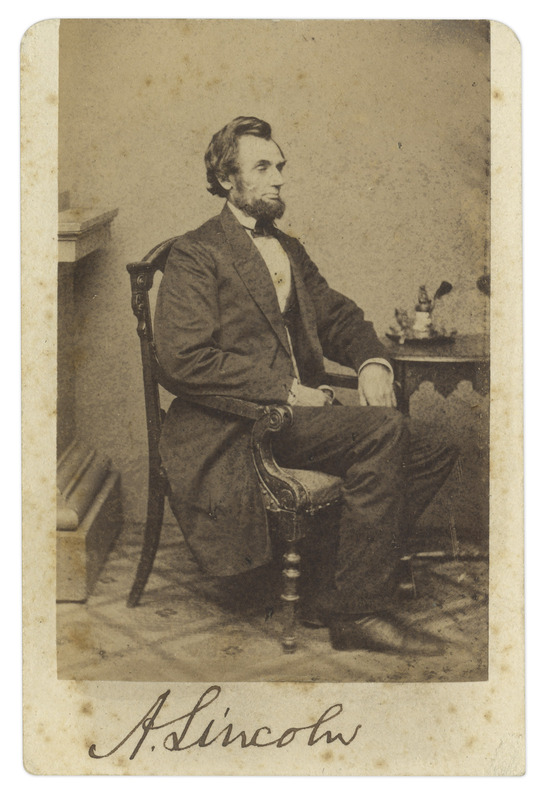 Exceptionally rare Abraham Lincoln signed carte-de-visite photograph, taken by Alexander Gardner in 1861 and signed as President. Signed ”A. Lincoln” below the seated portrait of Lincoln. 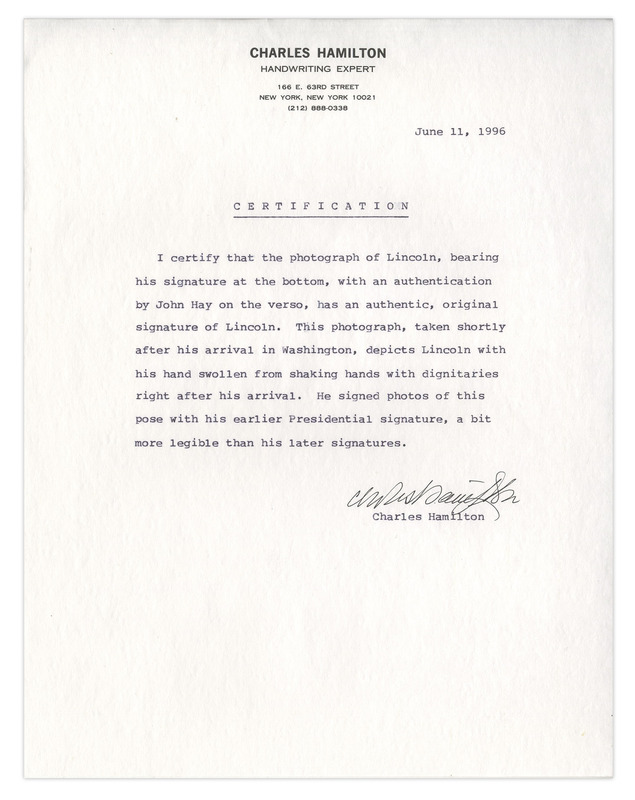 John Hay, Lincoln’s private secretary, authenticates the signature upon the verso by writing, ”I certify that the President’s signature is genuine / John Hay”. With ”Brady’s National Portrait Gallery” backstamp. Measures 2.5” x 3.75”. Very good with some foxing and wear, but with a strong signature by Lincoln. With provenance from Profiles in History and with a COA from Charles Hamilton. Sold for $49,913. Abraham Lincoln Signed CDV as President. Click to enlarge. COA for Abraham Lincoln Signed CDV as President. Click to enlarge.